Extreme emergency events of national significance that include manmade and natural disasters seem to have become more frequent during the past two decades. The Nation is becoming more resilient to these emergencies through better preparedness, reduced duplication, and establishing better communications so every response and recovery effort saves lives and mitigates the long-term social and economic impacts on the Nation. The National Response Framework (NRF) (http://www.fema.gov/NRF) was developed to provide the guiding principles that enable all response partners to prepare for and provide a unified national response to disasters and emergencies. The NRF provides five key principles for better preparation, coordination, and response: 1) engaged partnerships, 2) a tiered response, 3) scalable, flexible, and adaptable operations, 4) unity of effort, and 5) readiness to act. The NRF also describes how communities, tribes, States, Federal Government, privatesector, and non-governmental partners apply these principles for a coordinated, effective national response. The U.S. Geological Survey (USGS) has adopted the NRF doctrine by establishing several earth-sciences, discipline-level teams to ensure that USGS science, data, and individual expertise are readily available during emergencies. The Geospatial Information Response Team (GIRT) is one of these teams. The USGS established the GIRT to facilitate the effective collection, storage, and dissemination of geospatial data information and products during an emergency. The GIRT ensures that timely geospatial data are available for use by emergency responders, land and resource managers, and for scientific analysis. 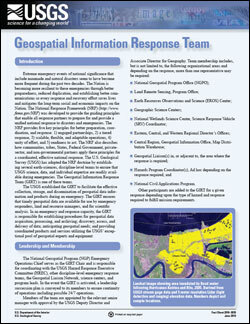 In an emergency and response capacity, the GIRT is responsible for establishing procedures for geospatial data acquisition, processing, and archiving; discovery, access, and delivery of data; anticipating geospatial needs; and providing coordinated products and services utilizing the USGS’ exceptional pool of geospatial experts and equipment. Witt, E.C., III, 2010, Geospatial Information Response Team: U.S. Geological Survey Fact Sheet 2010–3039, 2 p.